After a few hours of rain, it was sunny. My son & I were midway through the 5 hour trek to my hometown. We had shared fries, strawberry lemonade, and a love for Queen (though he prefers I not sing along). 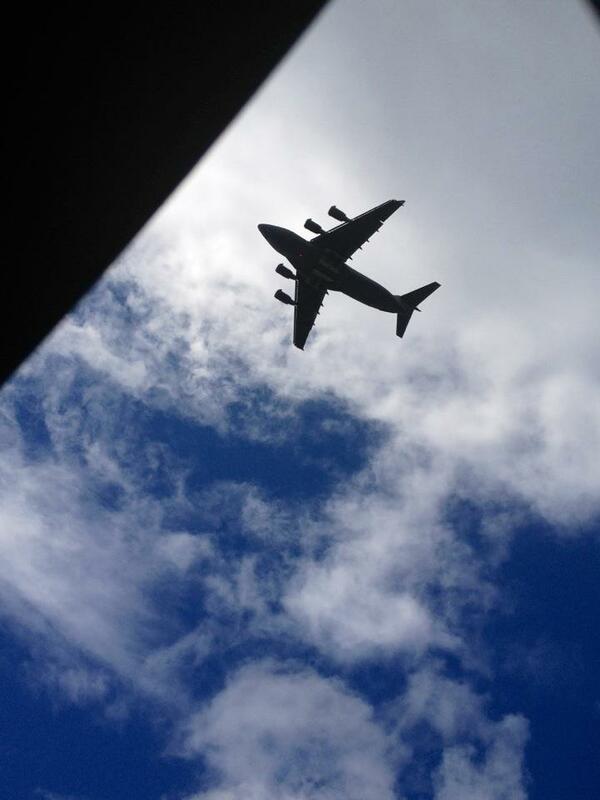 Just as I told him to put away his DS for awhile, I noticed two enormous airplanes coming our way - military transports. Even though I grew up in a Navy town, I still marvel at jets and all things jet-related. I pointed them out to Mason and told him to get a picture. He took about a dozen shots of those first two before we spotted another; he aimed my phone through the windshield, sunroof, and behind my back out the driver's side window. The best part of any day for me is connecting with my kids. In these moments on the road today, my son was not negotiating video game time or lamenting the lack of Weird Al in my iTunes or arguing about how stupid everyone in his school is. He was giddy with me about the size of these machines, their seeming proximity to our car, and what they symbolize; we giggled over his frantic attempts to find a perfect angle within the confines of our Mini Cooper. I love this post because to me there is nothing better in the world than connecting with our kids, particularly when it involves a "throwback" connection. Awesome photo and awesome story.